Our full company name is Manufacture Francaise des Pneumatiques Michelin (“Michelin”) and when you use our website and our services directly we act as a Data Controller. While everyone at Michelin is committed to protecting and respecting your privacy, we have a data protection Privacy Department who deals with all aspect of personal data at Michelin. You can contact them by sending an email to privacy.fr@michelin.com . Our site may contain links to and from our websites and digital platforms of our partner networks, advertisers, affiliates and social media pages. If you follow a link to any of these websites, please note that these websites have their own privacy policies and that we do not accept any responsibility or liability for these policies. Please check these policies before you submit any personal information to these websites. Information you provide to us when you complete a survey or respond to a questionnaire or submit a review or feedback (“Review Data”). To collect information about a specific matter, for example, our services to you or reviews of our products/services. In many cases surveys, and questionnaires are anonymous and we only collect personal information for statistical data. If this is not the case, we will let you know at the time of collecting the information. If such functionality is available, feedback and reviews may be disclosed on the Website with some personal information. In such case, you will be informed. Information may include your full name, your email address and other personal data requested. As the legal basis for processing Review Data, we will use our legitimate interests in the monitoring and improvement of our products and services to our customers and users and in the sharing of customer experience with webusers. While we like to retain reviews and feedback from you to help other webusers, we will anonymise or delete your reviews and feedback after 3 years. Any information collected pursuant to a survey or questionnaire will be deleted within 3 years of you submitting your responses. Any information retained will be statistical data only. Information you provide us when you communicate with us, e.g. by email or contact us form via our websites or through the live chat function on our website (“Communication Data”) This information is used to enable us to respond to or following up on your comments, queries or questions · Information may include your full name, your email address and other personal data you provide us to enable us to deal with your communication. We will use our legitimate interests in the assisting you and answering your communications as the legal basis for processing Communication Data. We will hold on to Communication Data for as long as it is necessary to enable us to deal with the matter relating to that communication. Once your matter has been dealt with, we will delete Communication Data within 6 months. When you provide us information (for example, the information set out in the scenarios above), in some cases we may ask you for additional, voluntary information. This information will be identified as optional and is used to help us better understand our customers and tailor our services to them. We also collect and use aggregated data such as statistical or demographic data (“Aggregated Data”). Aggregated Data may be derived from your personal information but does not reveal your identity in any way. For example, we may aggregate your Usage and Device Data to calculate the percentage of our website users accessing a specific feature of our website. Aggregated Data is used for our own business purposes only. While we do not request sensitive personal data, we do have sections on our websites where you can submit additional information, for example, when you submit a review. If you submit information on these free text section, only submit information you are comfortable providing and always bear in mind that it may be sensitive information. If you submit reviews or feedback for our website, please remember that this information will be visible to others users of our website. This website is not intended for use by children and we do not knowingly collect data relating to children. If we become aware that we are holding any information about children under the age of 15, we will take any actions necessary to comply with data protection legislation, including if appropriate, deleting the information. 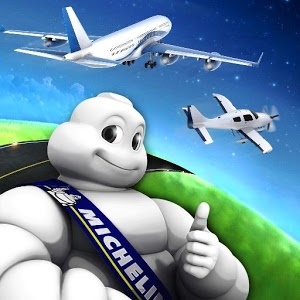 If you become aware that your child (under 15) has provided their personal information to us, without your consent, please let us know as soon as possible by emailing https://aircraft.michelin.com/contact-us so that we can take appropriate action. We may receive information about you if you use any of the other websites we operate or the other products and/or services we provide. We also work closely with third parties (including, for example, business partners, sub-contractors in technical, payment services, analytics providers, search information providers and credit reference agencies) and may receive information about you from them. The legal basis for his processing is our legitimate interests, namely monitoring and improving our website, products and services. Information from our web servers’ logs, for example information about your computer, such as your IP address, operating system and browser type. We may also collect information on the searches you carry out on our website and your interaction with communications we send you, for example, when you open email communications. (“Usage and Device Data”). This information is used by us for system administration and to analyse how people are using our websites and digital platforms. It also helps us to provide the best online infrastructure for your online activities. The legal basis for this processing is our legitimate interests, namely monitoring and improving our website, products and services. Our website may enable you to share your experience and connect with us through third party social networks such as Facebook and Twitter. We may collect this information from our social media sites, including likes, shares and tweets, and about the content on social networking sites. We do not control the privacy of the information you provide on social media networks and the privacy policies of those social media networks will apply when using their services. All information you provide to us is stored on secure servers within EEA. Within the Michelin Group – we may disclose your personal information to any member of our group, which means our subsidiaries, our ultimate holding company and its subsidiaries to the extent necessary for the same purposes of the initial processing set out in this policy. Service Providers – Michelin may share your personal information with selected service providers that Michelin may use to process your request or provide its services to you. These service providers act as data processors on our behalf and provide IT and system administration services, such as hosting and email services and managing the ratings and reviews. These service providers are legally obligated to keep the personal information they may have received confidential and secure and to use your personal information the basis of our instructions only. If we are under a duty to disclose or share your personal information in order to comply with any legal obligation, or in order to enforce or apply our terms and conditions and other agreements; or to protect the rights, property, or safety of the Michelin Group, our customers, or others. In this context, we may disclose your personal information to our professional advisors who are under a duty of confidentiality. For transfers within Michelin, the company has adopted internal rules governing the transfer of personal data from the European Union or European Economic Area. By clicking on BCRs, you can find the details of these rules. Transfers of data outside the group are governed either by the BCR of the subcontractor or by contracts containing the clauses of the European Commission for suppliers established outside the EU to guarantee a similar level of protection as that of your home country. How long will personal information be kept by us? As a rule, we will not hold your personal information for any purpose or purposes for longer than is necessary to fulfil the purposes we collect it for, including for the purposes of satisfying any legal, accounting, or reporting requirements. For more specific retention periods, please see section 5 above. You have the right to ask us not to process your personal information for marketing purposes. We will usually inform you (before collecting your data) if we intend to use your information for such purposes or if we intend to disclose your information to any third party for such purposes. You can exercise your right to prevent such processing by checking certain boxes on the forms we use to collect your information. You have the right to give us instructions on what we wish that we do with your personal information after your death. We will register it and if we heard that such event occurred, we will comply with your instructions. You can find further information on your data protection rights from the CNIL at www.cnil.fr . You can also make a complaint to the CNIL. Michelin ensures that your personal data are not altered, damaged or accessed by unauthorised third parties.